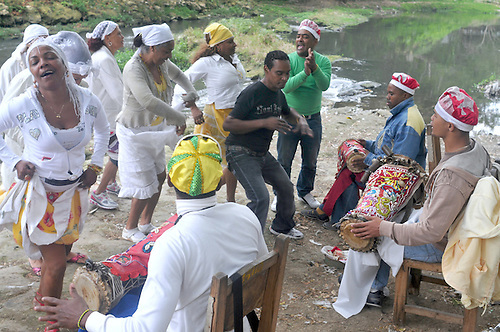 AFRO-CUBAN religious celebration came to Cuba by slaves captured in Africa and brought by the thousands to Cuba to harvest the Sugar cane. European disease wiped out all human life on Cuba within a 100 years of Columbus stepping foot on the island, there after the population either–came willingly or not, but come they did. Cuba was high industrialized and held market shares in the sugar, oil, rum, tobacco and ships left its port for all the important ports of Europe. Cuba was frequently the last land till ships of all flags reached their European Ports of Call and it was also a safe harbor during hurricane season. But eventually, thousands of Afro-Cubans mixed their religions and came together in a Cuban mixture of religions this ceremony held riverside in the Havana’s City Park this new years celebration sent specials wishes and prayers to the U.S.